Fear can have a big impact on how we see and interact with those around us. Here we explore some of the human cost of our fear of crime and what can be done about it. In community work we are encouraged to take an evidenced based approach to our work and evidence the outcomes. Statistical evidence tells us crime is down. However attend a public meeting in areas of high ‘disadvantage’, pick up a newspaper, or have conversation with someone in the neighbourhood about what changes are needed in the area and crime tends to dominate the conversation. Collectively, fear of crime has a greater impact on the quality of community life than the impact of actual crime. This is because the likelihood of our experiencing a crime is much lower than we expect from the actual prevalence of crime and because there are many more people whose life is influenced by fear of crime than will be a victim of crime. Some crime prevention cynics might even suggest that the fear of crime is a good thing because, by making people less likely to go out or making them more careful when they do, it helps to reduce actual levels of crime as there is a group of people who become victims of crime because of their over-confidence. But there is another side. Fear of crime leads families and individuals to live in their own safe little private bubble but often at high cost. A frail person might be afraid to venture out alone for a walk or exercise for fear of being attacked and so remain safely inside without the exercise and social interaction that are likely to prolong and improve their quality of life. Fear reduces trust between neighbours especially if they are new to the area. Rather than get to know our neighbours as people we often judge them on appearance, ethnicity, age, if they have children or parties or by how they dress. Fear can make us become overly anxious, depressed, stressed, isolated and frightened to participate. In extreme cases it can cause ongoing mental ill health. This fear has high social and economic cost and in certain communities these irrational and disabling fears can spread like cancer. Why is this fear so tangible despite the lack of a clear basis for it? Why do the responding strategies such as high visibility policing, safety audits, working committees, leaflets and poster campaigns etc. always appear to fail in delivering the desired results? Media have always known that sensational stories attract their subscribers and because good news doesn’t sell like fear and hysteria we hear little about the good news stories. NGOs have little incentive to focus on good news and community building because their limited and short term funding is based on addressing disadvantage rather than building on strengths. Politicians have few votes to gain by challenging misperceptions and gain a lot of political capital out of such fear – just look at how being tough on crime comes up every election from both major parties. Police enforcement tends to be responsive to crime which is often the symptom of broader social issues and not enough investment goes into addressing causes through prevention. Officers rightly focus on the major incident based crime rather than petty crime. However in my experience most complaints that breed fear and community frustration stem from issues which in the police scale of comparative priorities are often seen as minor nuisances. Disorder incidents are a case in point, often there is no crime involved. Incidents like street fights, arguments, loud parties, people loitering, young people congregating and ‘out of control’ dogs are among the activities that make people feel unsafe. 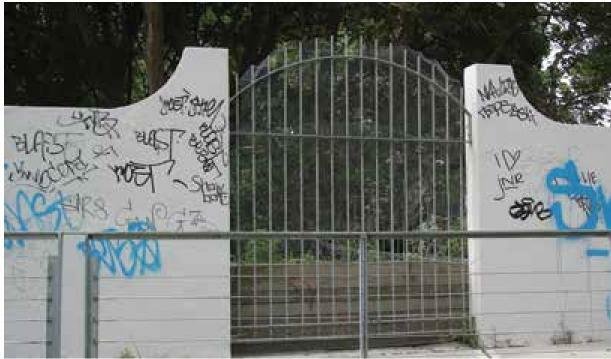 Vandalism and graffiti also adds to the sense of fear but it often has more to do with the design of the environment or building, poor lighting, inactive space and badly maintained public spaces and buildings than a crime wave. Most petty crime is low on police priorities and can be challenging in terms of time, detection and prosecution. Addressing petty crime can be seen by enforcement agencies as a mundane, thankless task. Waterloo Mosaic Project Community arts projects can help address graffiti. Projects that involve the community in designing and building artwork are much less likely to be vandalised because the community own, protect and respect them. So what can be done to reduce this fear? Having worked in a number of communities that have high levels of fear of crime, the strategies which made significant difference were ones that encouraged strong community bonds. Psychology tells us fear is a perception issue, based on our experience, social conditioning and our beliefs – both true and false. Positive experiences and challenging our beliefs about crime are some of the positive ways of countering our perceptions about crime and how likely we are to be impacted by it. Sound place management where buildings and common areas are kept clean and well maintained with visible and responsive security will enhance people’s sense of safety. This is primarily the responsibility of the landlord, and if carried out correctly makes a big difference both socially and economically. In addition when tenants take responsibility for their building and are allowed to be involved in the maintenance and upkeep of their common areas, they are more likely to take pride in their building and in their community. Great examples of projects like this can be found in Waterloo’s Odd Jobbers or Scotland’s Lend A Hand Project and in community gardens. Place making, well-resourced community development that focuses on relationship building through social and formal activities that provide people with the opportunity to make friends, creates a sense of pride and common ownership. The re-activation of dead community spaces through pop up events, community art, gardening and sports not only can bring people together socially but will often lead to trouble makers fleeing hot spots or trouble makers being engaging in positive ways. Community involvement in local decision making is also important as they are best placed to know what’s needed and what will or won’t work. Decision makers need to be non-defensive, transparent and have an honest dialogue with the community. They need to work with them in identifying issues and designing and implementing responses instead of creating “solutions” to what they think are the problems without reference to the community. Mural and arts projects like the Waterloo Mosaic Project (see photos) that involved community people in designing and building the artwork are much less likely to be vandalised than projects without such involvement because the community own, protect and respect them. Police enforcement on minor and serious crime has to be balanced with prevention, sound rehabilitation and support services if the cycle is ever to be broken. In reducing fear let’s not just focus on the potential victims. A more holistic approach to human services support service which is non prescriptive, accessible to all, and responsive to need. The Single Shared assessment model of the UK is great example of shared cased management. This has been one of the reasons behind the community push for greater co-ordination between Redfern and Waterloo human service agencies. Improvements in mental health support should lead to less calls to police to deal with out of control situations and also result in the community not feeling unsafe from as many mental health incidents. Police, Council and other community services participating in Community Safety BBQs and community events can also help concerned residents develop a better understanding of the risks of crime and what they can do about minimising their risk of experiencing crime in their home and on the street. Activities which help isolated people get to know people in their building, block or area also help people feel safer in the areas they most frequent. We also need to remember those who commit crime. Criminals often do so from place of pain, anger and frustration. All of which stems from their own irrational fear, entrenched poverty, the need to survive, learned behaviour and the inherent need to have sense of belonging. Therefore capacity building projects should focus on helping people change their life and help them make the right decisions. Courses on basic life skills such as managing relationships, coping with anger, conflict management, budgeting, promotion of health living and wellbeing. Activities which encourage people to understand their rights and responsibilities, and help people create a sense of place, pride and belonging go long way in reducing criminal and anti-social behaviour rather than the demonising that often goes on which does nothing to reduce crime. A local example is the work done jointly by Redfern police and Tribal Warrior’s Clean Slate Without Prejudice program. The program reduces the ‘them and us’ attitude between young people and the police, and provides young people with mentoring support along with the opportunity to socially participate in their community. Another example is the Beyond Walls Outreach Program that specifically targeted “street drinkers” and those participating in risky behaviour. The steering group for the project was the Waterloo Safety Action Group, a body set up by the public housing tenants’ Waterloo Neighbourhood Advisory Board. Tenant representatives were continually dealing with concerns from other tenants about street drinkers and users in the area. The worker was able to form bonds with people who were rarely engaged with services in any other way and supported them into services which provided intensive community support that they otherwise wouldn’t have accessed. Attempts to secure ongoing funding to roll out the program has proven challenging in the current fiscal climate even though the pilot was successful. See Beyond Walls: My Mondays in Waterloo for more on this project. Our strategies should involve a mixture of divisionary activities that prevent and divert as well as direct activities which address underlying causes. We should dismiss media which exaggerates crime and instead celebrate our community’s strength and progress. We should rebuild our sense of community pride and belonging rather than pander to the negative manipulation of our mass media and the rumour and fear mongers. As Yoda said in Star Wars “Fear is the path to the dark side. Fear leads to anger. Anger leads to hate. Hate leads to suffering”. Dealing with fear of crime is an important part of having safe healthy communities. Michael Shreenan is Chair of the ISRCSD Board, Executive Officer of The Factory Community Centre and also has community development experience in Scotland where he was also a Special Constable for 5 years.